The all-new Hyundai Santa Fe will be launched in Malaysia soon. A few days back the SUV was up on display at Hyundai Malaysia Facebook page and is now making its presence felt at the Kuala Lumpur International Motor Show 2018. The bookings are open now, and the Santa Fe is expected to cost around RM 188k (inclusive of 5-years/300,000 km warranty and 3-years/50,000 km free service). The 2019 Santa Fe will be available in both diesel and petrol choices. The 2.2 R CRDi unit generates 193 PS and 440 Nm, on the other hand, the 2.4-litre Theta II MPi motor churns out 172 PS/225 Nm. While the diesel engine is paired with a new 8-speed automatic gearbox and gets all-wheel drive powertrain, the petrol unit comes with a six-speed auto sending power to front wheels. The new Hyundai SUV features a 7-inch instrument cluster, an around-view monitor, powered front seat, leather upholstery and more. Santa Fe 2019 is available in 5 different colors - White, Blue, Red, Phantom Black and Lava Orange. News of an upcoming 2019 Hyundai Santa Fe started surfacing months ago from now. Many speculations were made about the new car. Hyundai recently launched the 2019 Santa Fe at the 2018 Gaikindo Indonesia International Auto Show (GIIAS) in our neighboring country, Indonesia. The 2019 Hyundai Santa Fe is the fourth generation of the car. It belongs to the premium SUV category and sits above the good Tucson. 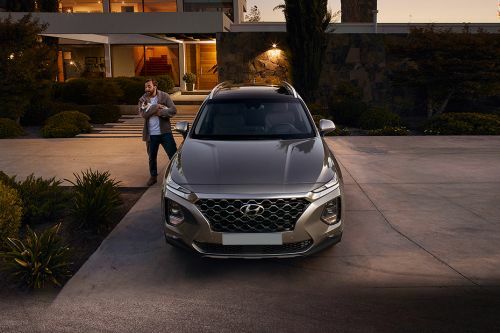 Hyundai has made several changes in the 2019 model of the Santa Fe to make it fulfill the modern-day requirements that the vehicle of its class should have. The design of the 2019 Santa Fe is inspired from the Hyundai Kona. The front end of the car is brilliantly finished. It is extremely attractive to look at and draws attention in a second. Hyundai’s new ‘signature cascading front grille’ fits perfectly into the picture. The pair of gorgeous headlamps features multi-tier lighting arrangement. The upper layer or tier is the LED daytime running lights, whereas the layer or tier underneath carry the main beams. The overall design and shape of the headlamps are flawless. If you think that the headlamps are the best lighting feature of the 2019 Hyundai Santa Fe, then we expect that you haven’t had a look at the rear end of this vehicle. Hyundai has done a fantastic job with the new tail lights. The design, shape, location, size, everything is just spot on, of course. But it is the extreme detailing of these lights that will blow your mind off. This is something similar to what you see in much more expensive and premium cars of Mercedes-Benz or BMW. A big thumbs up to Hyundai for this. The interior of the 2019 Hyundai Santa Fe is just as expected - premium. Some of the interesting features include a heads-up display, a high quality 12-speaker audio setup, 7-inch infotainment system, leather seats with heating and cooling function, etc. Hyundai claims that the outside visibility from the rear portion of the car has been increased using a 41% larger quarter glass. Hyundai has also worked on the interior space. The new Santa Fe offers more space for the middle and last row. The legroom for the middle row passengers have been increased by 38 mm and the seat base is 18 mm higher. The last row gets a headroom increase of 22 mm. Also, to make it easier to access this row, Hyundai has implemented a new one-touch seat folding function. For the Indonesian market, the 2019 Santa Fe has got two variants - GLS and XG - and is available in two engine options - 2.4-liter naturally aspirated petrol unit and 2.2-liter R-series CRDi turbo diesel mill. The former comes with a 6-speed automatic transmission whereas the latter gets an 8-speed automatic unit. The confirmation about the launch of the 2019 Hyundai Santa Fe in Malaysia is still pending. Hyundai has got a decent product lineup here. With the inclusion of the Santa Fe in its catalog, Hyundai can step into the premium SUV segment. At present, it only has the Tucson. The price range of the 2019 Santa Fe in Indonesia is from Rp 499 Juta (RM140,997) to Rp 569 Juta (RM160,776). It could be possible to see this car in Malaysia by the end of 2018 or maybe sometime during the first quarter of 2019.